A 25-year-old woman presented to the cardiology department with a history of shortness of breath and palpitations. A general cardiac examination showed regular pulse with a heart rate of 74 bpm and normal blood pressure of 120/80 mm/Hg. Heart sounds were normal. Blood work showed a raised eosinophil count. Chest X-ray showed mild cardiomegaly. The ECG was normal. Transthoracic echocardiography revealed a cystic mass within the heart. Cardiac MR imaging (MRI) was performed with ECG gating to further characterize this mass. Bright blood cine SSFP gradient 4 chamber and short axis views revealed a large, well-marginated, round mass in the lateral wall myocardium of the left ventricle (Figure 1A) which demonstrated markedly hyperintense signal brighter than blood (Figure 1B). The mass had thin regular walls and was seen bulging into the LV cavity in the vicinity of the mitral valve. On double inversion recovery black blood T2-weighted MRI, homogeneous hyperintense fluid signal intensity in the mass indicated it to be a cyst and a surrounding thin hypointense rim was appreciated (Figure 2). There was no enhancement of the mass while the normal myocardium was seen enhancing on dynamic post-gadolinium inversion recovery MRI (Figure 3). Cardiac echinococcosis is rare and constitutes less than 2% of all cases of hydatid disease.1 Parasite Echinococcus granulosus is the culprit pathogen that causes hydatidosis in the intermediary hosts, human beings. Human infestation by the larval stage of the parasite can lead to hydatid cyst formation in any organ, pleural cavity, or peritoneal cavity, as the larvae gain access to the portal circulation after ingestion of contaminated food. Hydatidosis commonly develops in the liver and lungs in humans. Imaging is the backbone for detection of echinococcal cysts anywhere in the human body, and especially within the heart. Cardiac hydatid cysts are most unusual and tend to remain asymptomatic until the cyst becomes large. The incidence ranges between .5 and 2%, even in endemic areas.2 The larvae usually gain access to the heart through the coronary circulation, though direct spread by rupture from primary lung or hepatic hydatid cyst is known to occur. Cardiac MRI is superior in diagnosis and detection of typical morphologic features of hydatidosis due to its excellent soft-tissue resolution. On MRI the cyst appears as a unilocular or multilocular, smoothly marginated, round mass that has hypointense signal on T1-weighted images and hyperintense signal on black blood DIR T2W images. The cysts are mostly single with an average size of 3-5 cm. The cyst wall may be thin or thick. When daughter cysts are present a multilocular mass is seen. A pericyst is typically seen in cardiac hydatidosis which appears as a hypointense peripheral ring around the lesion on T2-weighted black blood images. This hypointensity results from a dense fibrous capsule formed by the reactive host tissue.8 At times, the cyst may undergo degeneration and appear solid and this solid-appearing intracardiac mass proves difficult to differentiate from cardiac myxomas. Membranes may detach from the cyst wall and on SSFP MR Sequences, are visualized floating within the cyst. Dynamic gadolinium first-pass MRI serves to make this differentiation possible as cardiac hydatid cysts do not enhance, differentiating them from homogeneously enhancing myxomas. Cardiac MRI is an excellent modality for detecting and characterizing intracardiac hydatidosis. The modality confirms TTE findings, demonstrates the cyst, identifies associated complications and assists in planning surgery. Early diagnosis leads to quick referral for surgery, enabling prompt surgical cystectomy. Calami G,Perna A.M, Venturini A.Hydatid Disease of the Heart: Report of five cases and review of literature. Thorax. 1974; 29:451-458. Kardaras F, Kardara D, Tselikos D, et al. Fifteen year surveillance of echinococcal heart disease from a referral hospital in Greece. Eur Heart J. 1996; 17:1265–1270. Muthu SK, Thiagarajan A, Govindarajan S, Coutinho CM, Gunawardena WJ, Swaminathan TS. 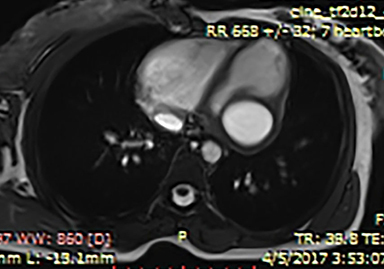 Hydatid cyst of the cardiac interventricular septum: Report of two cases. Br J Radiol. 2007; 80(959):e278–282. Leslie F, Bucci F, Giannoti D, Patrizi G, Redler A, Kucukaczu DS. 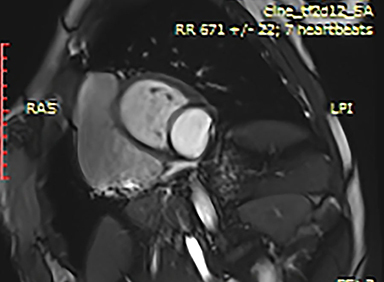 Giant cardiac hydatid cyst in children: Case report and review of the literature. Clin Med Insights Case Rep. 2014; 7:111-116. Pedrosa I, Saiz A, Arrazola J, Ferreiros J, Pedrosa CS. Hydatid disease: Radiologic and pathologic features and complications. Radiographics. 2000; 20:795–817. Oliver, JM, Sotillo JF, Dominguez FJ, et al. Two-dimensional echocardiographic features of Echinococcosis of the heart and great vessels. Clinical and surgical implications. Circulation. 1988; 78:327-337. Memduh D, Ege T, Yilmaz R, et al. Cardiac hydatid disease: CT and MR findings: AJR. 2008; 190:226-238. Mehta P, Prakash M, Khandelwal N Trop. Radiological manifestations of hydatid disease and its complications. Parasitol. 2016;6(2):103-112. Ozer N, Aytemir K, Kuru G, et al. 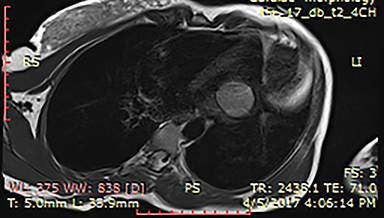 Hydatid cyst of the heart as a rare cause of embolization: Report of 5 cases and review of published reports. AmSocEchocardiogr.2001;14:299-302. Tuncer E, Tas SG,Mataraci I, Tuncer A et al. Surgical treatment of cardiac hydatid disease in 13 patients. Tex Heart Inst J. 2010;37(2):189-193. Mehra S, Garga UC. 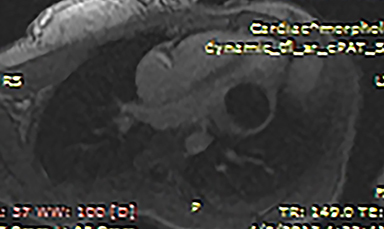 Left ventricular myocardial hydatid cyst. Appl Radiol. 2018;47(6):36-38. Prepared by Dr. Mehra and Dr. Garga while serving as Professors of Radio Diagnosis at the Post Graduate Institute for Medical Education and Research, RML Hospital, New Delhi, India.